Moving out of an apartment is a major undertaking that requires a lot of preparation. As you're gathering boxes, renting trucks and lining up help, don't forget to factor in a final cleaning before you leave for good. Just as with the actual moving process, you have the option of doing the cleaning yourself or hiring outside help. Before you flip a coin, consider these expert tips for making the decision. Each community has its own standards for acceptable move-out condition, ranging from broom-clean to white-glove. 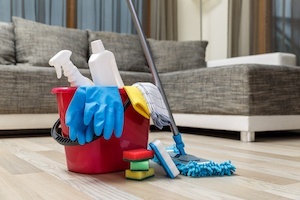 The more they range toward the latter, the more you may want to consider hiring a cleaning crew, especially if you've lived in your apartment for several years. Security deposits also vary greatly from one community to the next. If your deposit is a sizable amount and you don't want to risk a forfeit, you'll come out ahead even after the costs of hiring outside cleaners. When you're moving within the same neighborhood or same city, your schedule is more likely to accommodate a day or so devoted to cleaning. On the other hand, you probably can't or won't spare the time if your move is long distance or short notice. People sometimes hold off on replenishing supplies when they're planning to move. Do you have enough on hand to get you through a final cleaning, or would you have to restock and then transport those items to your new home? It's usually inconvenient to hold back vacuums, brooms and other bulky cleaning equipment. Check with friends or relatives to see if any of them could provide you with a temporary loan of these items. Reputable cleaning companies will be able to quote an accurate estimate based on the size of your apartment and the required tasks. You may be pleasantly surprised to find that the cost is well worth what you'll save in time and trouble. 6. Are You a "Neat Freak?" Some people enjoy house cleaning. If that doesn't sound like you, there's a chance you may run out of steam with the job only half finished, and putting it off for another day is not an option. 7. What About the Carpet? Carpets are sometimes evaluated separately from the general cleaning guidelines. This is an instance where your best bet is to consult management. Once you move out, new carpeting may be on the agenda, particularly if you've lived in your apartment for several years. If not, confirm whether or not professional carpet cleaning is required. Whether you're moving in or moving out of one of our Springs luxury apartment communities, your satisfaction is our main goal. Feel free to discuss your questions and concerns with a friendly member of our on-site management team.